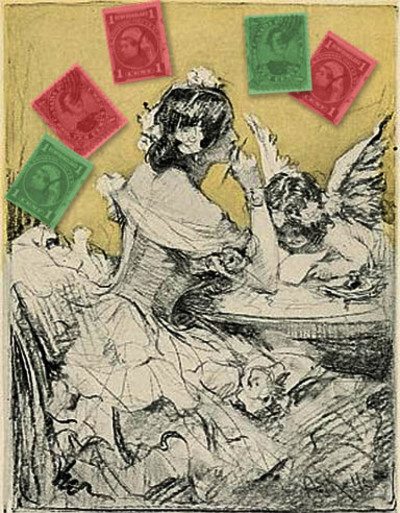 The Victorians had a way of communicating to their lovers so that lower classes did not know what they were saying with the way stamps were positioned on their letters/correspondence. Upside down, left corner—I love you. Same corner, crosswise—I love someone else. Straight up and down—Good-bye, sweetheart. Upside down on right corner—Do not write anymore. In the middle, at right hand edge—Write immediately. In left-hand corner—I detest you. Top corner, at the right—I want to be friends. Bottom corner, at left—I want to get to know you more. On line with surname—Have my love. The same, upside down—I am betrothed. At right angle, same place—I yearn to see you. What great fun in a time when mail was equivalent to the phone. I can just imagine the anticipation placing your stamp just so - waiting for the person to receive the letter and then waiting for a reply - agony for those brought up in the instant message era I'll bet. See how they used hankies for the same type of thing.